For additional information about this book, visit the website ButterPecanProductions.com. Savannah dislikes being new to Nashville. She feels like her life is a spiraling mess! Needless to say, Savannah is angry. She’s upset at the unexpected loss of her dad, bitter that she had to leave her old school and feels empty without her friends. Savannah hates the idea of going to Robert Churchwell Elementary. She thinks it is a school she will never learn to love until her mom shares the significance of the man the school is named after – Robert Churchwell. Gloria Respress-Churchwell’s stirring American story of Robert Churchwell, her father-in-law, told through a fi ctional character and Michael McBride’s rich illustrations introduce readers to an amazing man who made history by using his gift of writing. Robert Churchwell: Writing News, Making History is about the inspirational life of southern journalism pioneer Robert Churchwell. 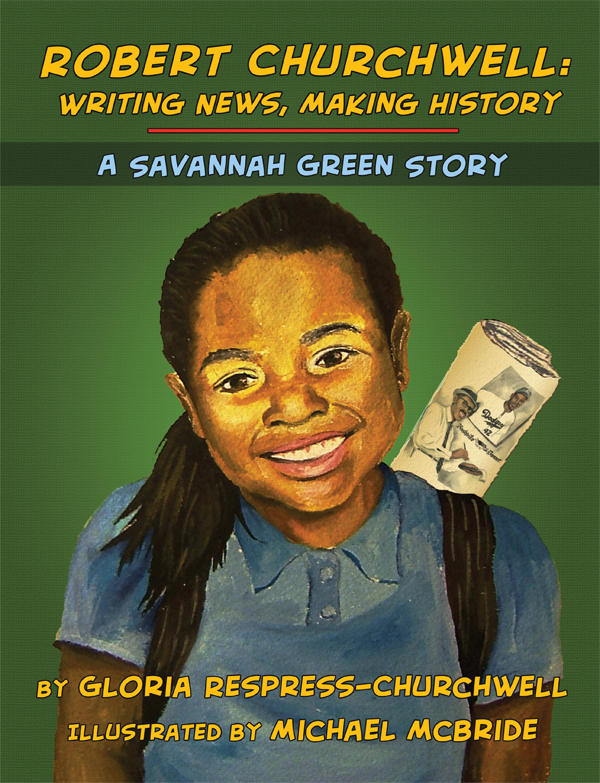 Churchwell's story is told through the eyes of a fourth grader named Savannah who loses her dad and moves to a new city where she attends a school that she knows nothing about. Savannah feels she has the worst life on the planet. Robert Churchwell’s triumphant true story guides her back on track by: journeying through the Separate but Equal era, trash diving for bones to survive the Great Depression, along with documenting the important contributions of opera singer Marian Anderson, Dr. Martin Luther King, Jr. and famed boxer Muhammad Ali. Connecting dots between Robert Churchwell as a journalism trailblazer and as The Jackie Robinson of Journalism, this book is a rich story that inspires all! Gloria Respress-Churchwell is President of Butter Pecan Productions, LLC; a creative company that produces educational resources for educators, parents, children, and youth including videos and print media. She has produced and directed premier documentaries at the Nashville Film Festival-award winner The Life of Robert Churchwell: The Jackie Robinson of Journalism and From Sag to Swag: The Power of Dress; analyzing the influence of dress on today's youth. She has also co-written an elementary school play about Robert Churchwell's life and is co-contributor of The Robert Churchwell Journalism Collection to the Smithsonian National Museum of African American History and Culture. The author has a passion for sharing Robert Churchwell's life-especially with children and youth; an inspirational story of determination, struggle and triumph. She lives in the New England area with her husband and 4 children.